OBRA Inc., an abbreviation for Organisasyon ng mga Batikan at Respetadong Artista ng Bayan, when translated in English, Organization of Expert and Respected Artists of the Philippines is the brain child of one person who's passion for the arts takes him to places. Nash Anggahan, the Founding Director of this non-profit organization has gone beyond the standards of being an artistic professional. A painter, a dancer, a director, a photographer, a web designer, an event organizer and even a model and cosplayer in his younger years, Nash embodies a person whose soul is fulfilled through its entanglement in the arts. Nash shares this passion with several other aspiring artists through forming OBRA. Although an abbreviation, the word means masterpiece when translated in English. True to its name, several subgroups and events were born under this organization. Of course, who can ever forget the unbeatable Dancepinoy.com which later on became a separate entitiy due to its unwavering popularity. It also hosted several dance workshop and auditions as it gave the spotlight to its core members, Dance Pinoy Team in variuos tv guestings. 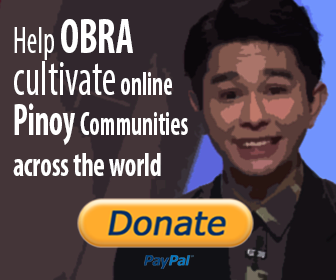 Right now, OBRA is actively producing quality and socially-relevant documentary films. Though its first production is not documentary, Nash together with Jophel Ybiosa and Michelle Rio flew to Thailand to represent the Philippines in the first Film Expo Asia and shot The Great Story of King Bhumibol Alduyadej. OBRA's debut documentary last year is iskWATER, featuring the people living near Estero de San Miguel won Grand Prize at the first South East Asian Student Documentary Award (SEADocs). WATER, a moving film about how we should preserve natural resources for the future generation also won first prize at the Digital Media Arts Category of the 2010 ASEAN-Korea Multimedia Competition. These consecutive achievements earned Nash the very prestigious 2011 Ani ng Dangal Award for Film given by the National Commission for Culture and Arts last February, the National Arts Month at Sofitel Plaza. He also was scheduled for courtesy call in Malacanang together with the other awardees as they were recognized by Executive Secretary Edwin Lacierda, in place of President Benigno 'Nonoy' Aquino III who was in Indonesia at that time. The 15th Congress also recognized Nash's outstanding achievements through Resolution No. 314 Commending Nash Anggahan by no other than Sen. Loren Legarda. Continuing his legacy in the documentary film industry, Nash yet again topped the Asian Development Bank's My View Video Competition 2011 with his entry My Riverside Story. The re-launching of OBRA Organization kicked off through a photoshoot entitled "Temperament", featuring the newly designated executives of OBRA Incorporated. Creative director Nash had his models dress up formally but set the shoot at the Wild Life Park in Quezon City. Additionally, the organization recently held an exclusive acting refresher courses conducted by Sir Bong dela Torre of Creative Body Movement and Dance and Rosswil Hilario of the National Commission for Culture and the Arts. 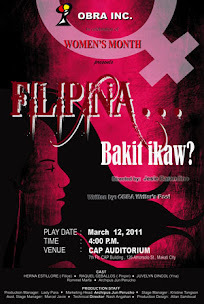 OBRA's upcoming project is the re-staging of Filipina...Bakit Ikaw?, a theater play tackling several issues Filipina women still experiences up to this modern day and age. The play is set this coming August 20-21, 10 am and 3 pm at CAP Auditorium, Makati. Currently in South Korea, Nash is expanding his horizons as he undergoes an extensive training while at the same time representing the Philippines at the 2011 NYC Leadership Training Youth Camp. Nash is sure to bring home these newly acquired skills for further enhancement of his ever-evolving OBRA.